Hello, brave new world with one more hour of sleep in it! Sorry this post is a bit late (though I doubt any of you are crying into your coffee over that! )–the blog was down most of yesterday, but Eric heroically fixed it. So now, the weekend! It included the cleaning and errands and work on the house that have become part of our weekend routine, but it also included party time at Hillary’s! We went over on Saturday afternoon and made Dia de los Muertos masks with the girls. All of my pictures of this are very blurry, so you’ll just have to imagine it! Then we made pizza. And cookies. And pie. 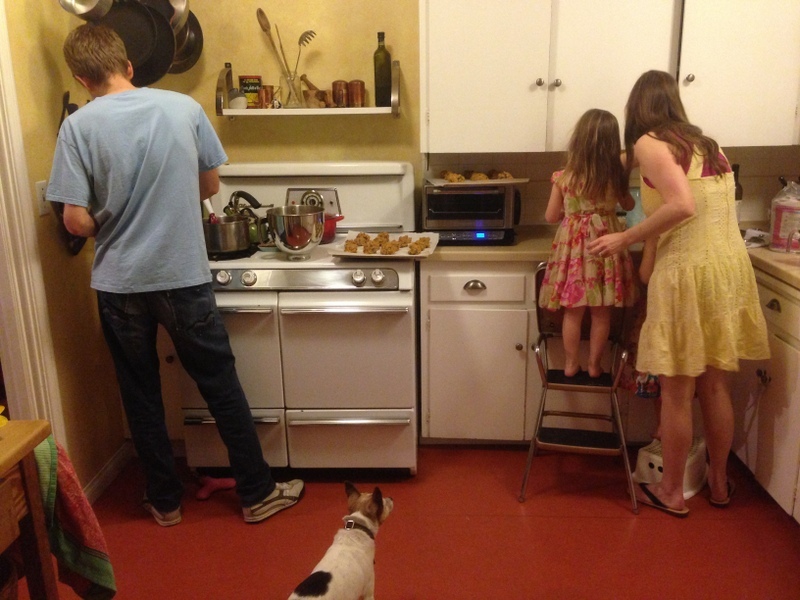 Hillary took this shot while Eric was getting the cookies ready for the oven, and the girls were helping me stir in some nutmeg. That’s Dora down at the bottom, hoping for some crumbs to fall her way. The cookies were delicious, as was the pie, before it went kerblap on the kitchen floor! At least we got to try it first! We watched a movie, and then I slept over with the girls. It was wonderful to wake up to cool breezes and hardwood floors, chickens in the backyard, a warm cup of coffee, two precious girls in wizard and princess costumes, and the most wonderful friend you could ever imagine. I spent most of Sunday basking in the afterglow and feeling so grateful: for friends, for fall, for pumpkin cookies, for laughter and joy. It was a great weekend indeed.